We enjoy lots of really cheap days out – many of which you only have to pay for parking, petrol and a picnic, however there are times when I think it’s worth spending just slightly more to have a really cool experience with the children – that still doesn’t come at the cost of one of the ‘bigger days out’. 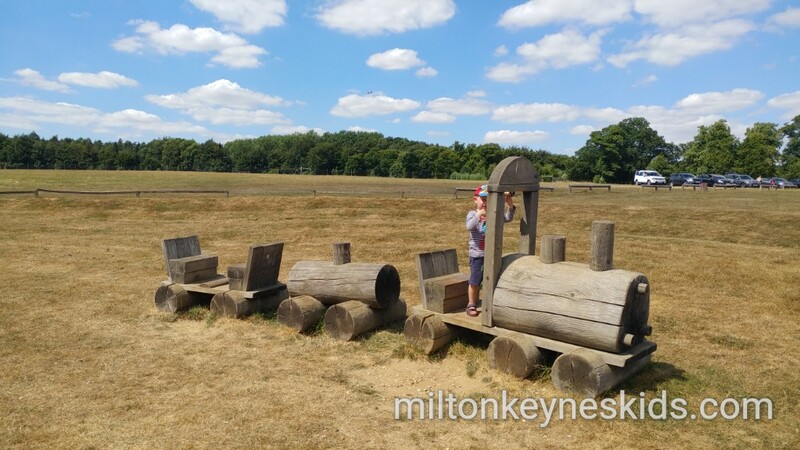 Knebworth House park and gardens fits that criteria – we had one of our best days out when we visited in July 2018. I struggled to cram everything into a one minute video, but these are the best bits. Do bear in mind if you’re looking to visit, it’s only open until 30th September 2018 before closing for the Autumn and Winter. Where is Knebworth House park and Gardens? Knebworth house is a grade two listed country home situated in Knebworth, Hertfordshire. It’s most famous for it’s grounds having hosted a number of big concerts including Robbie Williams and Oasis. It’s also known for featuring in various tv and films. The postcode is SG1 2AX. 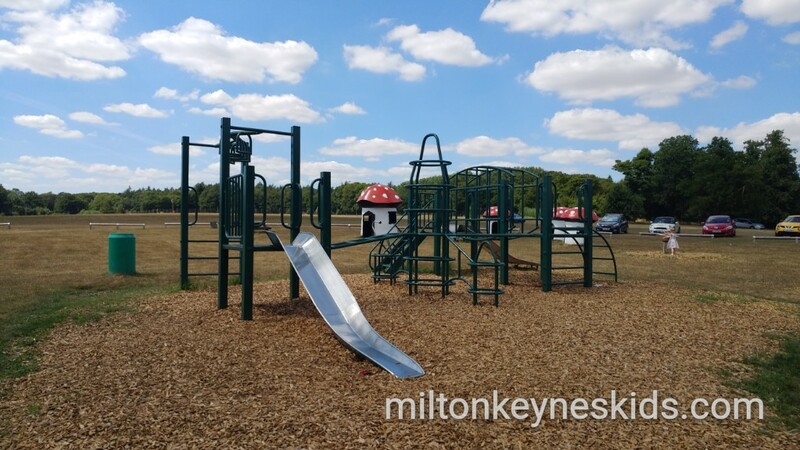 It’s about 45-50 minutes from where we live in Milton Keynes – we found the fastest route was joining at A1 via the A421, but you can join the A1 further south. What’ are the gardens like? At the time of visiting, my sons were five and three and we decided not to go in the house but just to explore the park and gardens. We arrived when it opened and had to queue for about 10 minutes in the car before paying at a kiosk. You can then park in one of two places, either at the gardens or at the adventure playground. Parking is free. We drove up to the gardens. The gardens are big with loads of space for the children to run around and explore. There’s a fun maze which only takes a few minutes to walk around, but great for younger children. There are lots of wooden sculptures dotted around the gardens. 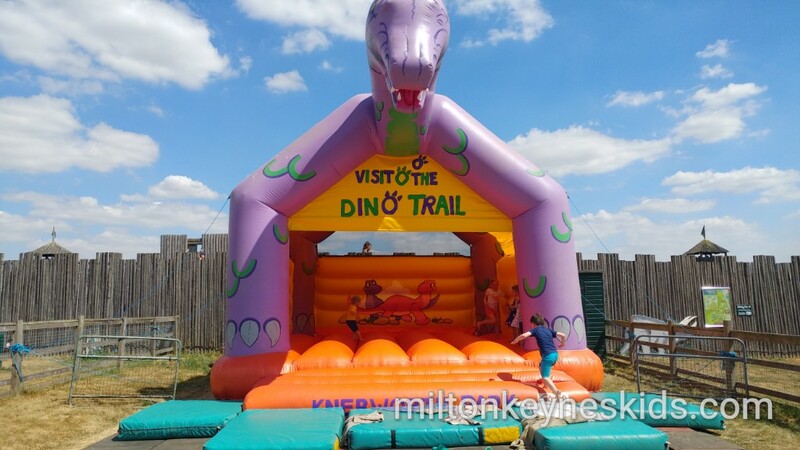 The biggest highlight though is a dinosaur trail. 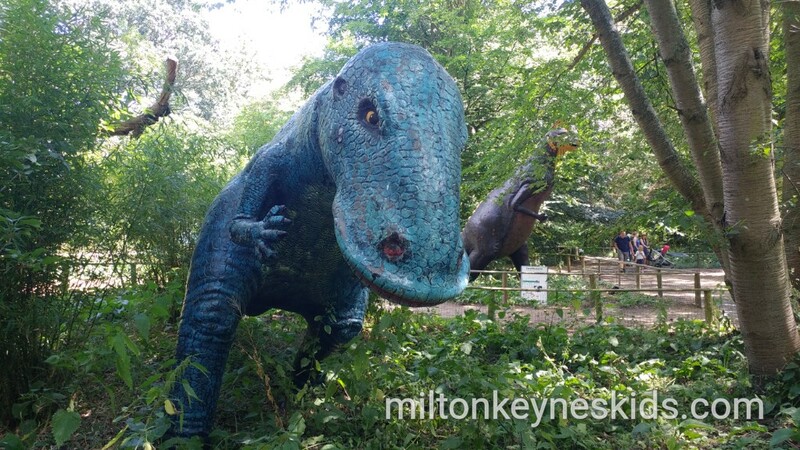 There are 70 dinosaur models in among the trees including some really impressive ones like a T-Rex. There’s also a place where you can hear what some of them used to sound like when they roared. You can wander around at your leisure. My sons also enjoyed a big blackboard for doing lots of chalk drawings on. 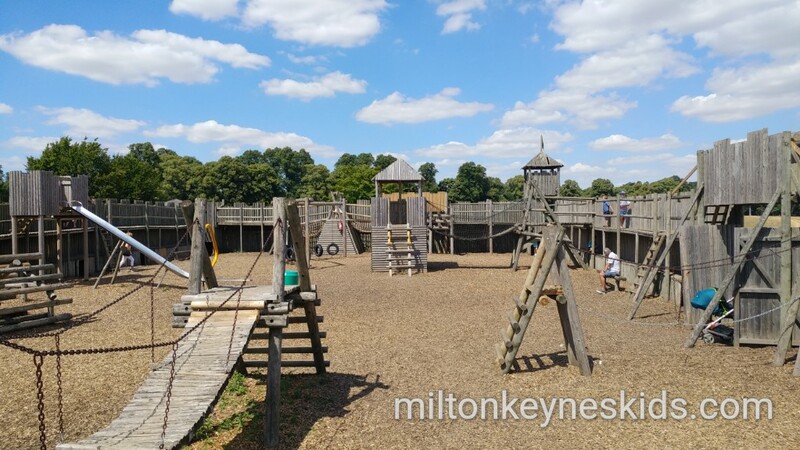 What’s the Fort Knebworth adventure playground like? You can walk from the gardens to the play area, but it’s a good 25 minute walk over grassland so I’d suggest you drive and then park your car there. The play area is brilliant. 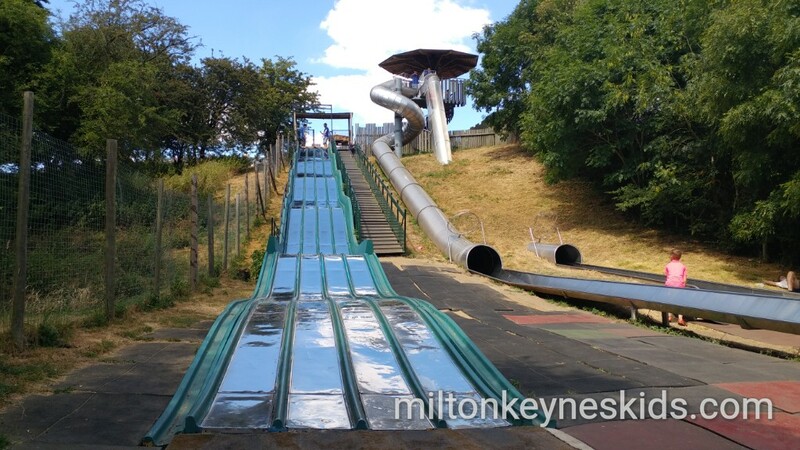 The highlight is three really cool slides – a bumpy one, a twisty one and a drop one. 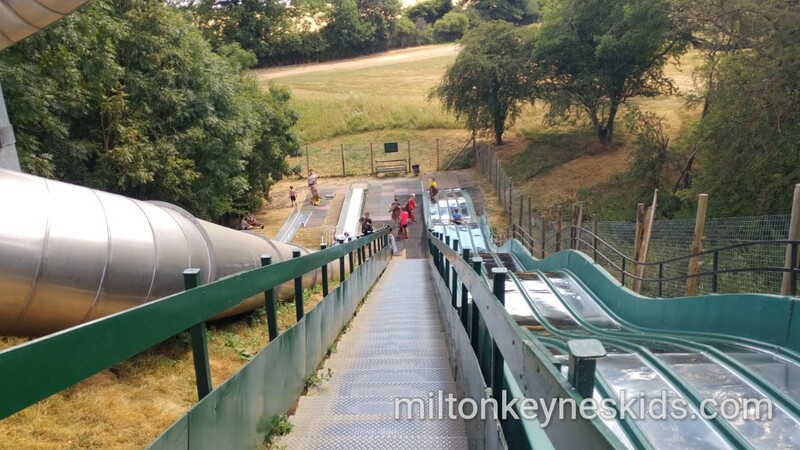 What was really impressive is that there were attendants at the top of all the slides ensuring children were correctly in their sacks and making sure they only went when it was safe. My three year old was fine on the bumpy one – although it is quite fast when you’re that little. My 5 year old was confident enough to go on the twisty one, but I’d suggest the drop one is better for brave older children. The wooden fort itself feels a bit dated but my children still liked playing around it. Another highlight are the water features – you have to pump on several pieces of wooden equipment to make water come out elsewhere. 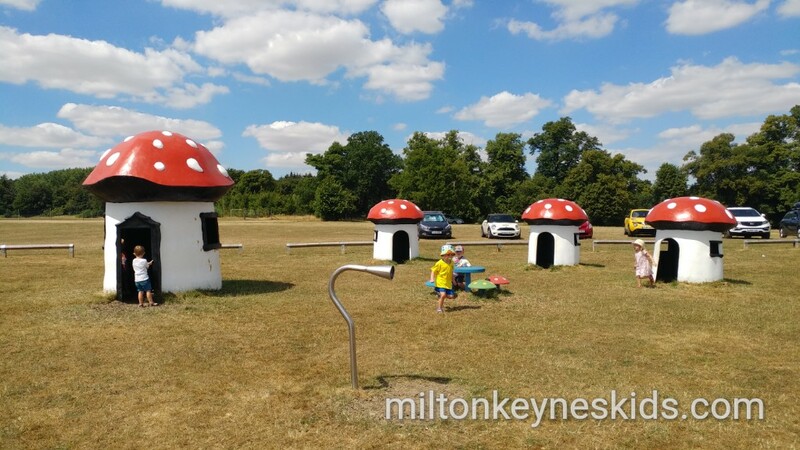 The toadstools are very pretty and little children will enjoy running in and out of them. There’s a bouncy castle which again is staffed. There are swings, climbing frames and a zipwire. It’s all really spread out. 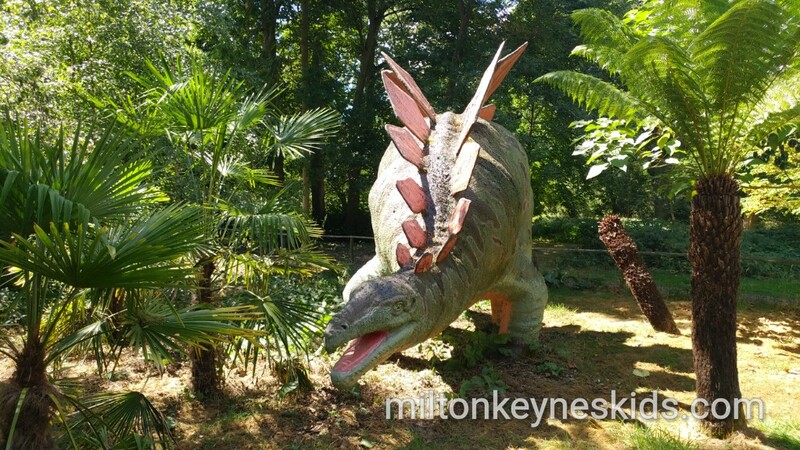 What did we like most about Knebworth House park and gardens? We went on a really hot day in July 2018 and for some reason it was very quiet so the park had a rather chilled out vibe. Because it’s such a big site people are spread out in different places so it felt very relaxed. 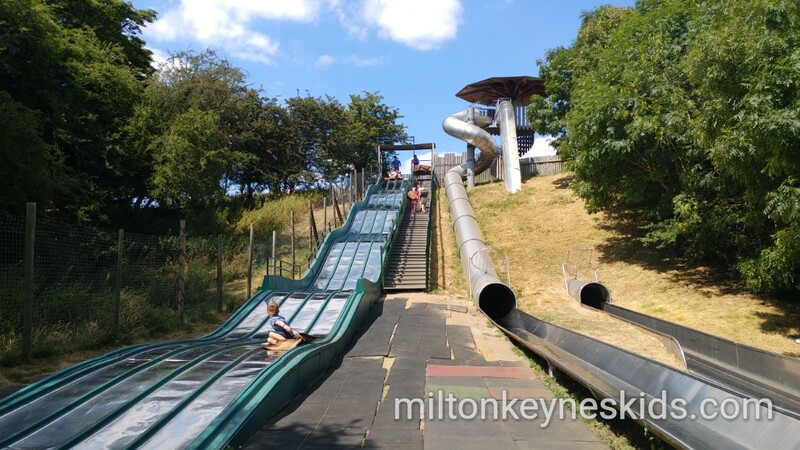 The slides are brilliant for all ages and have a wow factor – if it wasn’t so hot we could have spent ages going up and down them. 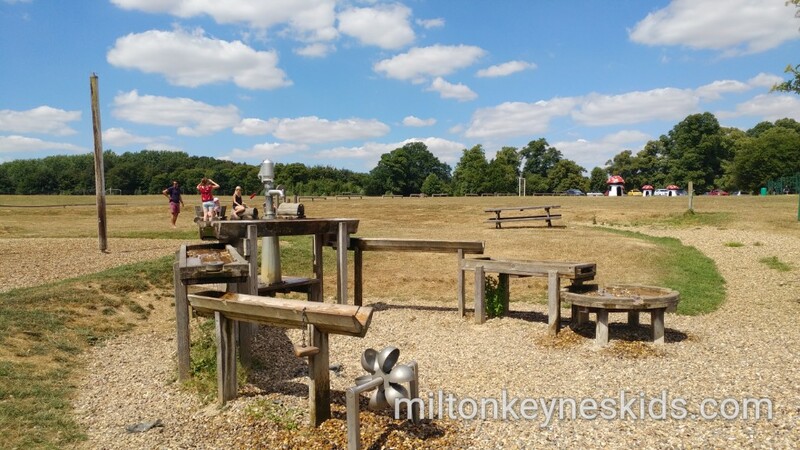 I would say some of the play equipment is quite old – it feels a bit eighties – but I liked that quirky aspect to it. We didn’t have time to go on everything as there is quite a lot to try. The gardens themselves I think would be even more beautiful if we hadn’t been in a heatwave when we visited and could have taken time to explore them more. 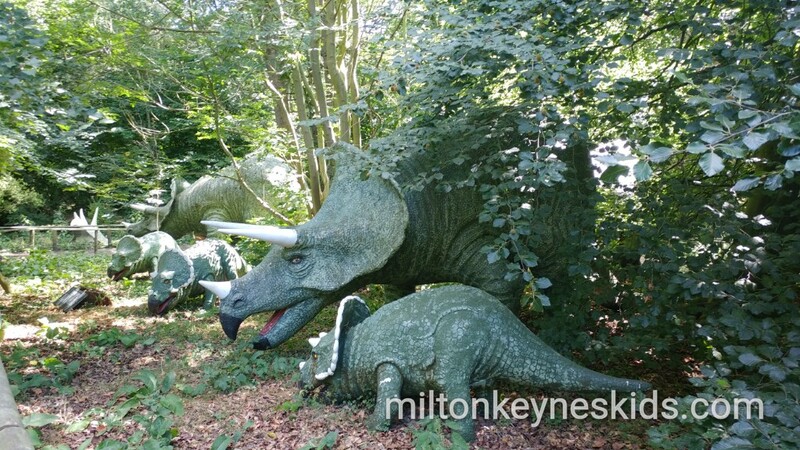 The dinosaur trail is still fun and exciting and gives children a way of seeing dinosaurs without having to visit one of the more expensive wildlife parks. What could be improved about Knebworth House Park and Gardens? Just a couple of things I’d suggest could be improved. The gardens probably need a couple more signs directing you to the dinosaur trail – we just wandered around until we found it which was fine – but we were stopped by others who couldn’t find it. 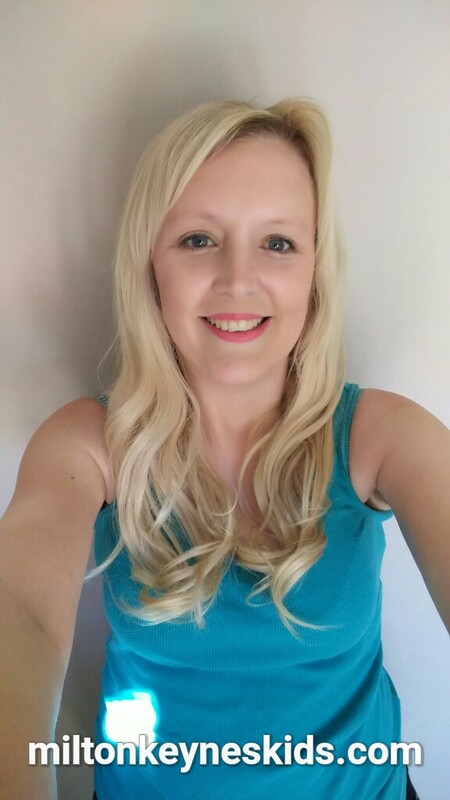 If you do go on a really hot day be really careful if your children go on the bouncy castle – the ground was so hot I had to lift my son up quickly – they really need to put some mats down. And the parking area for the play area is right next to it so do keep a close eye on your children – it’s not fenced off. How much does it cost to go to Knebworth Park and Gardens? At the time we visited in July 2018 it cost £9.50 each and under 3s were free. Or £34 for a family of four. If you want to visit the house too then it costs £13. Arguably the park and gardens are similar to going to a country park, but I would say there is more there to do and is worth the money. Any tips for going to Knebworth House Park and Gardens? Yes! It’s seasonal. They’re only open from the end of March until the end of September so do check opening times and dates before you visit on their website. We didn’t buy advance tickets, and there isn’t a separate queue for advance tickets so it doesn’t save you much time on arrival, but if you’re travelling from some distance then do check it hasn’t sold out on their website, or give them a ring, they seem to hold a lot of events and I don’t know how popular they are. There is little shade so make sure you take suncream and hats with you. There are a few benches under shade in the park.There is a nice cafe and gift shop but we took a picnic. Children will get wet around the water features so take spare clothes with you if you don’t think they’ll dry off.